Hardhay, Amber, Goatweed, Klamath Weed, Tipton Weed, St. John’s Word, St. Johnswort, Witches’ Herb, Y Fendigedig (Welsh), Balm of Warrior’s Wounds, Devil’s Scourge, Touch and Heal, Lord God’s Wonder Plant, st johns wort, St. John’s wort. It can cause dermatitis or photo-sensitivity after taking it internally and then exposing the skin to the sun. Contact dermatitis can be caused if handling the plant in moist, but sunny, conditions. Drug Interactions: Do not take in conjunction with MAO inhibitors or other antidepressants, including Prozac, Paxil, Zoloft, lithium, Demerol, or destromethorphan, a common ingredient in cough syrups. The combination can result in a very dangerous reaction called serotonin syndrome, marked by a high fever, confusion, muscle rigidity, diarrhea, and possible death. Native to Britain and Europe, the herb now grows wild throughout most of the world. It is found in meadows, on banks, and by roadsides, preferring chalky soils and sunny positions. The herb is an erect perennial that grows to about thirty-two inches and produces bright yellow flowers that form in a flat-topped cluster and display tiny black dots on the petals and sepals. The flowers are harvested in mid-summer. Since at least the 5th century BCE, the herb has had a reputation as a wound herb. It is said that the herb was given its name from the Knights of St. John’s of Jerusalem who used it to treat wounds on the Crusades battlefields. It is also said that it received its name from squeezing the dots on the flowers. When squeezed, the dots ooze a red pigment that is said to represent the blood of St. John the Baptist. The plant traditionally blooms by June 24, which is also associated with John the Baptist, according to the Catholic calendar. It was believed that the herb dispelled evil spirits, and the insane were often forced to drink infusions made from the plant. According to the Doctrine of Signatures, because the herb was yellow, it was associated with “choleric” humors and used for jaundice and hysteria. Old herbals often refer to Tutsan (H. androsaemum) from the French toutsain, or heal-all, which was also used to treat injuries and inflammations. Although it fell into disuse in the 19th century, it has recently regained prominence as an extremely valuable remedy for nervous problems. Used for hundreds of years by the Klamath, Nez Perce, Umatilla, Yakima, and other Native American tribes, this herb has a calming effect on the nerves, but is also considered a stimulant by some herbalists. Dioscorides, Paul of Aegina, Pliny, Galen have all referred to the plant as one that relieves excessive pain, removes the effects of shock, and has a tonic effect on the mind and body. As such, it is especially valuable for post-surgical pain. When it arrived in the New World, it quickly took over vast tracts of land, especially in the Pacific Northwest where it was known as the Klamath weed. Cattle loved, it but those that ate large quantities became sun-sensitive and ultimately developed severe sunburn. When herbacides failed to control its growth in 1946, an Australian beetle, that also loves the herb, was imported; and, within a decade, the weed was declared under control. As with anything introduced against nature, the beetle thrived to the point that it is now threatening commercial growths now that the herb has become popular. A number of Hypericum species contain hypericin, but in smaller quantities than St. John s Wort. St. John’s Wort and several Hypericum species have shown antitumor activities in animals and at least seventeen species have demonstrated antibacterial properties in vitro. Some species show antifungal activity and at least seven show antiviral properties. Extracts of H. perforatum have produced antidiarrheal, sedative, antitumor, and diurectic actions. Hypericin, an active substance in the herb, is thought to increase circulating levels of serotonin, a neurotransmitter instrumental in controlling mood by selectively preventing its reuptake by cells. This mechanism of action is similar to that of Prozac, Zoloft, and other antidepressants. It may also inhibit MAO, a brain enzyme that destroys seratonin, epinephrine, and dopamine, the mood-elevating neurotransmitters. Infusions are used for anxiety, nervous tension, irritability or emotional upsets, especially if associated with menopause or premenstrual syndrome. Tinctures are taken for at least two months for long-standing nervous tension leading to exhaustion and depression. They are also used in cases of childhood bedwetting. Washes from infusions are used to bathe wounds, skin sores, and bruises. Creams made from the flowering tops are used for localized nerve pain (sciatica, sprains, and cramps) or to help relieve breast engorgement during lactation. The cream can also be used as an antiseptic and styptic on scrapes, sores, and ulcers. Infused oils from the flowering tops can be used on burns and muscle or joint inflammations, including tennis elbow, neuralgia, and sciatica. A few drops of lavender oil can be added for burns, or mixed with yarrow oil to treat joint inflammations. The red colour of the infused oil is caused by hypericin, which is strongly antidepressant and so strongly antiviral that it is being researched for treatment of the AIDS virus. It is also an excellent antiseptic, and used on wounds, burns, and to relieve cramps and nerve pain. It is one of the most valuable European medicinal plants for nervous problems. Herbalists have long used it to treat anxiety, tension, insomnia, and depression especially associated with menopause. Although widely used to treat depression, it is also helpful in alleviating fatigue and seems effective in helping menstrual cramps and PMS. There is also some evidence that it can fight HIV. Contemporary herbalists are now using it to treat AIDS and other immunosuppressed conditions. It is also a valuable tonic for the liver and gallbladder. Infused oil is useful in treating gastric inflammation and peptic ulcers. Infused oil from these yellow flowers turns a blood-red during the steeping process. Cold-pressed safflower, walnut, or sunflower oil is used then left in the sun for a few weeks (usually about six). 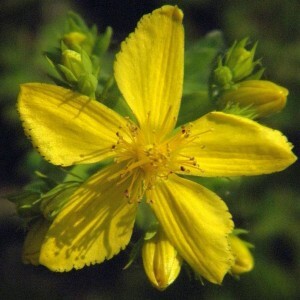 Learn more about St. John’s Wort including drug interactions on our Cloverleaf Farm Blog. 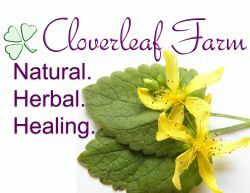 View St. John’s wort products at Cloverleaf Farm.